Sometimes Dr. Jekyll, sometimes Mr. Hyde. Smooth Ambler is the second Spirit producer that references walking and we're sure you won't walk away from this bottle unimpressed. Deep in the Appalachian hills where natural spring waters flow and fresh mountain air... well, floats (? ), a team of Whiskey-loving friends established a state-of-the-art distillery. They produce vodka and gin, but also mature hundreds of barrels of Whiskey. When the time of bottling comes, the entire community joins in and everyone signs their own bottle. The only contradiction found in this Bourbon is in its name, because this Spirit is bound to agree with many. It's a blend of two Whiskeys: a young wheated and an old rye-rich Bourbon. Talk about bridging the intergenerational gap, right? While these two Spirits had their time to blend and meld, this Whiskey taste like two distinct separate Bourbons at different times, so there could be a bit of a contradiction in there. But it's a badass contradiction; like Jekyll and Hyde. 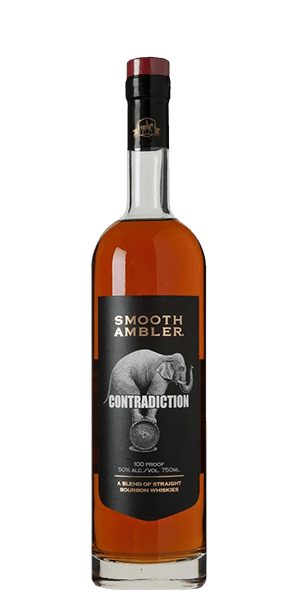 What does Smooth Ambler Contradiction Bourbon taste like? The Flavor Spiral™ shows the most common flavors that you'll taste in Smooth Ambler Contradiction Bourbon and gives you a chance to have a taste of it before actually tasting it. I like it, but it's better in a Manhattan than it is straight up. Boy, I really enjoyed this on the rocks...I think this might be one of my new favorites! Smooth as silk isn’t even giving this one justice! A fine example of a blend done right. Smooth & warm. Great straight up. A very full, rich bourbon. The combination of older rye bourbon and younger wheated bourbon comes together in a magical way. Little more bite than I like on the first sip, but every sip after that was very good. Very smooth, and the blend of the two bourbons keeps you wanting that next sip just to try picking out more of the flavors that mesh so well together. Really good bourbon. So far this has been my favorite bottle that I’ve ordered, so much so to the point that it’s slowly becoming my daily drinker! So smooth, great to sip, the vanilla notes are quite nice. At this price point, it is very hard to beat. Excellent blend! Very smooth. The vanilla hits your nose immediately, but it’s not overpowering. Great neat and easy to sip. Will be keeping this one in the rotation! I've never had a bourbon quite as smooth as this, and for being 100 proof, and blended - that's all the more incredible. It's pretty tasty as well! All in all, this is a unique and pretty outstanding whiskey. Very dynamic and one of the most original flavors I’ve ever had. A great dram to keep in the rotation when you want something unique. Probably one of the worst bourbons I've ever had. My wife prefers rye, I like a great wheated bourbon. This bottle is always in the rotation at our house.